The United States and its people are looked upon favorably by much of the world, despite substantial concern over U.S. international policies, its business practices and even its ideas about democracy. The United States is rated favorably by majorities in 35 of the 42 countries where the question was asked. But the U.S. is viewed only somewhat favorably in virtually all of these countries. Moreover, negative opinions of the U.S. have increased in most of the nations where trend benchmarks are available. Opinion of the U.S. varies greatly around the world. More than eight-in-ten respondents in countries such as Venezuela, Ukraine, Ghana, Uzbekistan and the Philippines have a positive view of the U.S. Negative opinion of the U.S. is most prevalent in the Middle East/Conflict Area, but by no means is it confined to those countries. Roughly half of Argentines look upon the United States unfavorably, as do sizable minorities in countries ranging from the Slovak Republic to South Korea. America’s image among its closest allies remains largely positive, although it has declined over the past two years. At least seven-in-ten in Great Britain, Canada and Italy, and roughly six-in-ten in France and Germany, still retain a favorable opinion of the United States. Yet relatively few people in these countries have strongly positive feelings toward the U.S. and favorable opinion has diminished among three of four major U.S. allies in Western Europe. The picture is similar in Eastern Europe, where solid majorities look favorably at the United States. But up to four-in-ten in the Slovak Republic dislike the U.S. and in four of the six Eastern European countries surveyed opinion of the U.S. has declined since 2000. Russia is an exception to this trend. Fully 61% of Russians have a positive opinion of the United States, a substantial increase from 37% two years ago. Public opinion about the United States in the Middle East/Conflict Area is overwhelmingly negative. Even in countries whose governments have close ties with the United States, such as Jordan, Turkey and Pakistan, substantial majorities have an unfavorable view of the United States. Fully three-quarters of respondents in Jordan, the fourth largest recipient of U.S. assistance, have a poor image of the United States. In Pakistan and Egypt nearly as many (69%) have an unfavorable view and no more than one-in-ten in either country have positive feelings toward the U.S. In Jordan, Pakistan and Egypt, the intensity of this dislike is strong – more than 50% in each country have a very unfavorable view. Public perceptions of the United States in Turkey, a NATO ally, have declined sharply in the last few years. In 1999, a slim majority of Turks felt favorably toward the U.S., but now just three-in-ten do. As is the case in Pakistan, Jordan and Egypt, the intensity of negative opinion is strong: 42% of Turks have a very unfavorable view of the U.S. The same pattern is evident in Lebanon, where 59% have a poor opinion of the U.S.
Uzbekistan, a new U.S. ally in the fight against terror, is a notable exception to this negative trend. By nearly eight-to-one (85%-11%) Uzbeks have a positive opinion of the United States and more than a third (35%) hold a very favorable view of the U.S.
On balance, Latin Americans have a positive impression of the United States. This is particularly the case in Venezuela, Honduras and Guatemala, where eight-in-ten have a favorable opinion of the U.S. 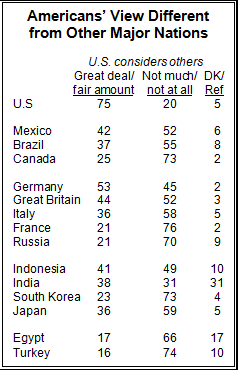 Solid majorities in Peru, Mexico and Bolivia assess the U.S. in positive terms. Yet people in Latin America’s two largest countries – Brazil and Argentina – have a decidedly mixed view of the U.S. Barely half of Brazilians now hold the United States in good stead, and America’s image has declined sharply in Argentina. Just 34% of Argentines voice a favorable opinion of the U.S., down from 50% in 2000. Overall, in seven of the eight Latin American countries surveyed, favorable opinion has declined since 2000. In Asia, there is strong support for the United States in Japan and the Philippines, both long-time U.S. allies. Yet South Koreans are much more skeptical despite that country’s close military and economic ties with the U.S. More than four-in-ten South Koreans (44%) have an unfavorable opinion of the U.S.
Nearly half respondents in Bangladesh (47%) and more than a third in Indonesia (36%), where opinion has declined over the last two years, express an unfavorable opinion of the U.S.7 America’s image in India is also mixed, with a slim majority of Indians (54%) viewing the U.S. favorably. Publics in Africa have a generally positive attitude toward the U.S. More than three-in-four in the Ivory Coast, Kenya, Mali, Ghana and Nigeria voice favorable opinions of the U.S., and majorities in the other countries agree. In general, there is limited evidence to support the widely held view that poverty fuels discontent with the United States. There is only a clear correlation between low income or a sense of deprivation and anti-American feelings in roughly one-in-three countries surveyed. This relationship is most apparent in Eastern Europe and the Middle East/Conflict Area. In these countries, people who are less well off economically are more likely than those who are more financially secure to dislike the U.S. Yet in Africa, Latin America and Asia, where poverty is widespread, the relationship between deprivation and anti-American sentiment is apparent in some countries but not others. Age is often a factor in attitudes toward the United States, but its effect varies in different countries. Older people in Eastern Europe and Latin America, in particular, express more negative views of the U.S. compared with younger people in those regions. Yet in Canada, this age gap is reversed: 44% of Canadians below the age of 30 have an unfavorable opinion of the U.S. compared with just 20% of those age 50-64. This tendency of younger people to be more negative toward the U.S. is also true to a lesser degree in the Czech Republic, Bangladesh and South Korea. Most of the respondents to this survey have not visited the United States. But an analysis of results from 21 of the nations surveyed shows that those who have traveled to the United States, or are in regular communication with Americans, have a more favorable opinion of the U.S. compared with those who have had no comparable exposure. This is even true in countries where many hold an unfavorable view of the U.S.: Jordan, Lebanon, Turkey and South Korea. Not surprisingly, people from countries in closest proximity to the U.S. have the most frequent contact with Americans, through travel and direct communications. Nine-in-ten Canadians say they have visited the United States, as have sizable minorities of British (40%), Germans (25%), French (14%) and Japanese (25%). Many Latin American respondents say they stay in regular contact with someone in the U.S., including roughly half or more Guatemala, Mexico and Honduras. Even in countries where relatively few people have visited the United States – such as Vietnam, Senegal and Ghana – nearly 20% have regular contact with someone in the U.S.
‘America’ and ‘Americans’: Less of a Distinction? Historically, people around the world tend to have a more positive view of Americans than of the United States. But this distinction is fading, as respondents in only 13 of 43 countries surveyed expressed more positive attitudes about Americans than the U.S.
People in nearly every Latin American country assess “Americans” in the same terms or more negatively than they assess “the United States.” On the other hand, those in Canada, Asia and Western Europe (and to a lesser extent Eastern Europe) are still more likely to make this distinction. In these countries, respondents have more favorable reactions to Americans than to the United States. In some parts of the Middle East/Conflict Area, people have higher esteem for Americans than they do of the U.S. This is especially the case in Jordan, where roughly half have a favorable view of Americans and just one-in-four say the same about America. 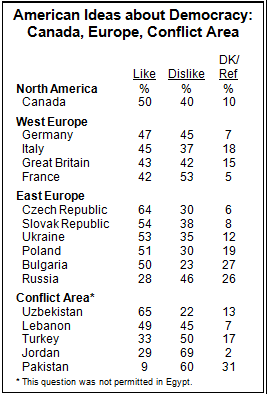 But in Egypt, Pakistan and Turkey, views of Americans are nearly as negative as views about the United States itself. In some ways, the war on terror provides a useful prism for analyzing opinion toward the United States. There is broad support for the U.S. goal of combating terrorism, with the notable exception of those countries in the Middle East/Conflict Area. Yet there is an equally strong global consensus that the United States disregards the views of others in carrying out its foreign policy. 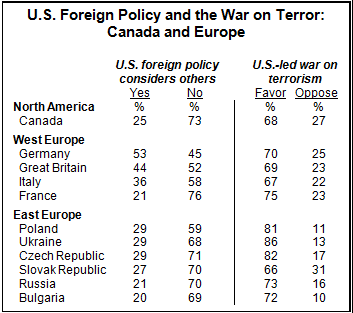 This duality of opinion is evident among the United States’ closest allies: By wide margins, respondents in Canada and Western Europe support the U.S. struggle against global terrorism. Fewer than three-in-ten in any of these countries oppose that effort. But with the exception of Germany, majorities in these countries believe United States fails to take into account the interests of their country when making international policy decisions. A similar pattern is evident in Eastern Europe, where there is even stronger support for the U.S. fight against terrorism. In Russia, for instance, supporters of the fight against terrorism outnumber opponents by nearly five-to-one (73%-16%). As in Western Europe, people in this region overwhelmingly view U.S. as unilateralist, with no more than three-in-ten saying the U.S. takes their country’s interests into account. Publics in the Middle East/Conflict Area share Europeans’ concerns about U.S. unilateral actions, but strongly oppose the U.S. struggle against terrorism. The single exception is Uzbekistan, which has by far the most favorable opinion of the United States among these countries. Jordanians, in particular, are overwhelmingly opposed to the war (85%-13%). Majorities in Egypt, Lebanon and Turkey and a plurality in Pakistan, a key U.S. ally in the region, also oppose the war on terror. In Pakistan, Lebanon and Egypt, Muslims are more likely to oppose the U.S.-led efforts to fight terrorism than non-Muslims. The prevailing opinion among people in this region is that the United States ignores the interests of their countries. This view is as dominant in Turkey (74%), a NATO ally, as it is in Lebanon (77%). By contrast, the growing U.S. military role in Uzbekistan has apparently improved opinion of the United States in that country: Six-in-ten Uzbeks believe the U.S. takes their interests into account and nine-in-ten favor U.S.-led efforts to fight terrorism. Opinion is divided in Latin America over whether the U.S. acts unilaterally in making foreign policy decisions. 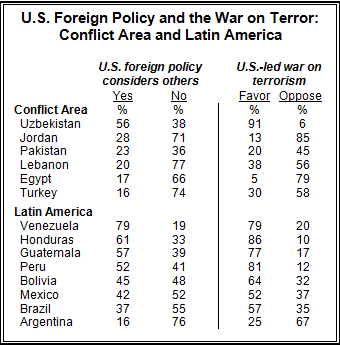 Majorities in four of the eight countries surveyed – Guatemala, Honduras, Venezuela and Peru – believe the U.S. takes their interests into account when making policy decisions, and there is strong backing in these four countries for the struggle against terrorism. But in the other Latin American countries surveyed, the dominant view is that U.S. does not take into account the interests of others. 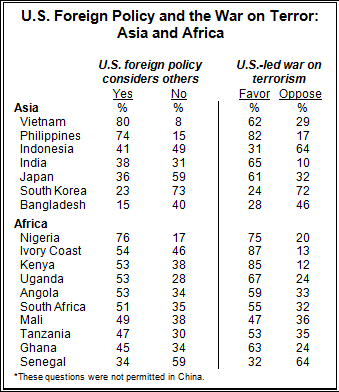 Support for the war on terror also is considerably lower among these countries. This is particularly the case in Argentina, which has the most negative view of the United States of any country in the region. Three-quarters of Argentines see the U.S. going it alone in setting its foreign policy and just a quarter support the U.S.-led war on terror, underscoring the intensity of negative sentiment toward the U.S. in this country. Among Asian countries surveyed, South Korea stands out for its opposition to the war on terror and its belief that the United States pays little attention to Seoul’s concerns. By three-to-one, South Koreans oppose the war on terror, and by roughly the same margin respondents in this country view the United States as acting unilaterally. A solid majority of Japanese (59%) also says the United States disregards Japan’s interests, though support for the war is much higher there than in South Korea (61% vs. 24%). In Bangladesh and Indonesia, pluralities say the U.S. disregards their countries interests and majorities oppose the war on terror. Along with South Korea, those two predominantly Muslim countries register the broadest opposition to the war among countries in this region. Opinion is much more favorable to the United States in the Philippines, Vietnam and India. In the Philippines, which has strong historical ties to the United States, most say the U.S. takes their interests into account. In Vietnam, where there has been a recent warming of diplomatic relations with the United States, eight-in-ten say the U.S. takes their interests into account. In India, a plurality (38%) say the U.S. takes their interests into account, although nearly as many (31%) disagree. Publics in Africa generally feel that their countries’ interests are taken into account by the United States, at least more so than other respondents from other regions. A large majority of Nigerians say their country’s interests are considered by the U.S., and half or more in five of the other African countries concur. These countries also support the war on terror. By contrast, in the largely Muslim countries of Senegal and Mali, support for the U.S.-led war on terror drops below 50%. And as is true in many other countries with sizable Muslim populations, Muslims in Nigeria and Senegal are less supportive than non-Muslims of the U.S.-led fight against terrorism. In general, respondents to the global survey are more critical of U.S. policies than they are of U.S. values. In nearly every country surveyed, at least a plurality blames differences their country has with the United States on policy disputes rather than on fundamental differences over values. Again, this is true even in the Middle East/Conflict Area. More specifically, there is a strong sense among most of the countries surveyed that U.S. policies serve to increase the formidable gap between rich and poor countries. Moreover, sizable minorities feel the United States does too little to help solve the world’s problems. These sentiments are not limited to poor countries or those with unfavorable opinions of the United States. In fact, in Germany, France and Canada, roughly 70% say U.S. policies serve to widen the global economic divide. There is less of a consensus on the U.S. role in solving world problems. Outside of Germany, relatively few say the United States does the right amount in this regard, but they disagree about whether the U.S. does too much or too little. Analysis indicates both sentiments are meant as criticisms of the U.S. In Eastern Europe, as in Germany, more people believe the United States is doing the right amount to alleviate global problems. Solid majorities of Czechs and Slovaks say this, as do roughly half of Ukrainians and Germans. At the same time, most Eastern Europeans fault the U.S. for contributing to the gap between rich and poor nations. Perhaps not surprisingly, criticisms of the U.S. role in the world resonate strongly in the Middle East/Conflict Area. Three-in-four Egyptians and roughly two-thirds in Lebanon, Jordan and Turkey are critical of America’s role in solving the world’s problems. People in Latin American countries, many of which are struggling economically, are also critical of U.S. policies. A plurality in every country says those policies increase the gap between rich and poor, and in all Latin American countries majorities say the U.S. is not doing the right amount to solve world problems. This same pattern is evident in the Asian and African countries surveyed. Overall these publics feel the U.S. does not do the right amount to solve world problems and adds to the gap between rich and poor countries. Two countries in Africa are important exceptions. In Nigeria and Kenya more people say U.S. policies lessen the gap between rich and poor countries (64% and 41%, respectively). Despite criticisms of U.S. policy, most people around the world think that a rival superpower would make the world a more dangerous place. This certainly is the case among U.S. allies in Canada and Western Europe, where large majorities believe this. In general, people around the world object to the wide diffusion of American ideas and customs. Even those who are attracted to many aspects of American society, including its democratic ideas and free market traditions, object to the export of American ideas and customs. Yet this broad-brush rejection of ‘Americanism’ obscures the admiration many people have for American culture and particularly U.S. science and technology. Publics in every European country surveyed except Bulgaria are resentful of the American cultural intrusion in their country. The British have the most favorable view of the spread of American ideas, but even half of British respondents see this as a bad thing. Strong opposition to the spread of American customs and ideas is seen in France and Russia, where the number expressing an unfavorable opinion of the United States is relatively high. In the Middle East/Conflict Area, overwhelming majorities in every country except Uzbekistan have a negative impression of the spread of American ideas and customs. Just 2% of Pakistanis and 6% of Egyptians see this trend as a good thing. Even in generally pro-American Uzbekistan, 56% object to the spread of American ideas and customs. The sentiment also appears throughout Latin America and Asia (with the exception of Japan and the Philippines). In Argentina and Bolivia, two countries in which there is considerable antipathy toward the U.S., more than seven-in-ten resent the spread of Americanism. And in Asia, the two countries that most object to American ideas are the predominately Muslim countries of Indonesia and Bangladesh. In Africa, public attitudes are generally more pro-American. In Nigeria and the Ivory Coast, majorities say the spread of American customs and ideas is good. In most other African countries, only about half of respondents, at most, oppose the diffusion of American ideas. The exceptions are Tanzania, Senegal and Mali, where more than six-in-ten say that the spread of American customs and ideas is bad. U.S.-style democracy gets a mixed review in the other Western democracies surveyed. Less than half in every Western European nation surveyed say they like American ideas about democracy. However the U.S. democratic model is viewed positively in many of the democratizing nations of Africa, Asia and Latin America. Views of American democracy are somewhat better in Eastern Europe. Roughly half in the Slovak Republic, Bulgaria, Poland and Ukraine favor American ideas about democracy, and nearly two-thirds in the Czech Republic hold this view. Russians, however, offer a much more negative assessment. Just three-in-ten say they like American ideas about democracy. The European preference for social democracy may help explain the uneven reaction to American-style democracy. In Germany and five of six Eastern European countries surveyed, broader attitudes concerning the role of government are linked to opinion of the U.S. approach to democracy. People who say it is up to the government to insure that no citizens are in need tend to reject American-style democracy. By contrast, those who favor a more minimalist government role favor the American form of democracy by higher margins. The Middle East/Conflict Area has the greatest antipathy toward American ideas about democracy. Consistent with their largely unfavorable views of the U.S., half or more in Turkey, Pakistan and Jordan say they dislike this foundation of the American political system. Opinion is split in Lebanon, with 49% expressing a preference for U.S.-style democracy. In Latin America, Asia and Africa, public opinion of American democracy generally mirrors overall attitudes toward the United States. Solid majorities like American ideas about democracy in three of the eight Latin American countries surveyed – Venezuela, Guatemala and Honduras. And half or more dislike American democracy in the three Latin American countries with the lowest favorable opinion of the U.S. – Bolivia, Brazil and Argentina. Among most Asian countries surveyed, American democracy is viewed more favorably. Majorities or pluralities of publics in Asia say they like American ideas about democracy. India, the largest democracy in the world, is an exception, with just 36% positive toward American ideas about democracy. An equal number in India, which is modeled after the British political system, declined to offer an opinion. 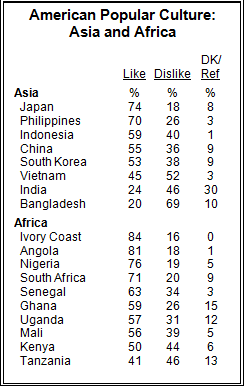 African countries generally hold the most favorable opinions toward American ideas about democracy. Majorities or pluralities in all 10 countries surveyed like American democracy, and support is especially strong in Kenya, Ghana, Nigeria and the Ivory Coast. Support is more tempered in Tanzania, Angola, Mali and South Africa. People around the world have a mixed reaction to exports of American ideas, but they have no such ambivalence concerning U.S. science and technology. Large majorities around the world admire the U.S. for its technological and scientific advances. Moreover, in most countries American technology is admired more than American ideas about democracy, ideas about business, or popular culture. 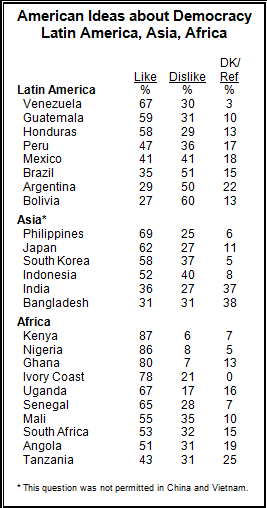 In many countries in Africa, Asia and Latin America, more than 80% of the public says it admires U.S. technology. This is the case even among publics that have low regard for the United States generally. In Jordan, where just a quarter have a favorable opinion of the U.S., 59% say they admire U.S. technological achievements. Even in Pakistan, where one-in-ten have a positive image of the U.S., a 42% plurality says they admire U.S. scientific advances. Russia is the only notable exception. Nearly half of Russians (44%) say they do not have high regard for U.S. accomplishments, the highest proportion among any country surveyed, compared with 41% who take a positive view of U.S. scientific advances. A dominant image of “what America is” to the outside world is its music, movies and television. American popular culture is readily available nearly anywhere in the world, and in some countries the market for American cultural products is very strong. At the same time, the invasion of American culture is often a complaint, particularly when it is seen as coming at the expense of indigenous cultures. Still, publics around the world generally embrace American music, movies and television. American popular culture is particularly favored by the young. In nearly every country, the percent of young people who like American movies, music and TV is dramatically higher than among older people. 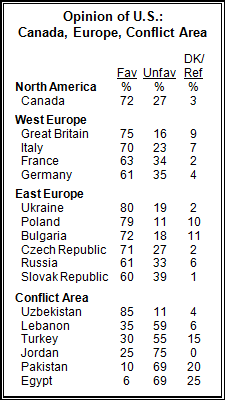 People in Western Europe and Canada have a strongly favorable view of American popular culture. Even in France, whose government has tried to discourage consumption of American culture, two-thirds like American movies, music and TV. Opinion is somewhat less positive in Eastern Europe. Half of Russians dislike American cultural exports, while sizable minorities in Ukraine, the Slovak Republic and the Czech Republic concur. Poland and Bulgaria are the only two countries in Eastern Europe with solid majorities who like American popular culture. Pakistan stands alone in the extent of its dislike of American popular culture. Eight-in-ten Pakistanis dislike American music, movies and television. Opinion in the other countries in the Middle East/Conflict area is also negative but not as extreme as in Pakistan. Majorities in Jordan and Cairo dislike U.S. culture, as does a plurality in Turkey. In Lebanon, where most have an unfavorable view of the U.S., 65% say they like American music, movies and television. For the most part, people in Latin America, Asia and Africa are solidly positive toward American music, movies and television. This includes China, where American music has become very popular among young people despite government efforts to promote Chinese performers over artists from the West. Still, sizable minorities in several of these countries – China, Indonesia and South Korea — say they dislike American popular culture. Majorities in Bangladesh and Vietnam also take a negative view of American popular culture. And in India, where Bombay’s thriving “Bollywood” aims to rival Hollywood, there is broad antipathy for American music, movies and television. Just a quarter of Indian respondents say they like U.S. cultural exports. In Africa, majorities in eight of the ten countries surveyed like American popular culture. At least 70% say they like American music, movies and television in Angola, the Ivory Coast, Nigeria and South Africa. Kenya and Tanzania are much more evenly divided. Many of the respondents in the global survey, taken after revelations of American corporate wrongdoing, expressed an aversion to U.S. business practices. This was especially the case among major U.S. trading partners, such as France, Germany and Canada. There is, however, more acceptance of the American way of doing business in Asia and in the emerging market economies of Africa. In Eastern Europe, opinion is more favorable toward American business practices. But the Czech Republic, which has the region’s most globalized economy, is a notable exception. Roughly half of Czechs have a negative view of U.S. business tactics, while 44% favor the American approach. Opinion toward U.S. business practices is linked with underlying attitudes about the free market. Publics who believe people are not better off in a free market system are more likely to say they dislike the American way of doing business. This is particularly true in Europe and Latin America. The Middle East/Conflict Area has a largely unfavorable view of American business mores. In line with their negative impressions of American democracy (and the U.S. generally), half or more in Jordan, Turkey and Pakistan say they dislike American business practices. 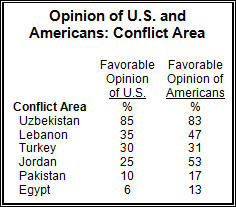 Lebanon and Uzbekistan are exceptions, with majorities holding favorable opinions of American business practices. Majorities in three Latin American countries – Bolivia, Argentina and Brazil – dislike American ways of doing business. These same countries, including Mexico, also have the largest percentages that dislike American ideas about democracy. By contrast, majorities in Guatemala, Honduras and Venezuela like American ideas about business practices. Majorities or pluralities in China, India, Indonesia, South Korea and the Philippines say they like American business practices. In Japan, a large U.S. trading partner, opinion is split – 40% like and 40% dislike American business practices. Opposition to American business practices is the greatest complaint about the U.S. made by the Japanese, who otherwise like most aspects of American society. African countries generally hold favorable opinions toward American business practices. Pluralities in all 10 countries surveyed like American business practices, but there is especially strong support in Nigeria, Kenya and the Ivory Coast. Support is much lower in Mali (48%), Tanzania (47%) and Angola (41%). In general, antipathy toward the U.S. is shaped more by what it does in the international arena than by what it stands for politically and economically. In particular, the U.S.’s perceived unilateral approach to international problems and the U.S. war on terror play large roles in shaping opinion toward the U.S.
Those who think the U.S. does not take their country’s interests into account when making international policy and those who oppose the U.S.-led war on terror are much more likely than others to have an unfavorable opinion of the U.S. This is particularly true in the Middle East/Conflict Area, Eastern Europe and Latin America. Other attitudes are less closely linked with overall opinion of the United States. European and Asian publics that dislike American ideas about democracy are more likely to express an unfavorable opinion of the U.S., and vice versa. In Latin America, by contrast, attitudes toward American technology and scientific advances bear a strong relationship to opinion of the United States. And in Africa, attitudes toward American business practices affect overall opinion of the U.S. There is a great divide between global attitudes and public opinion in the United States. Americans generally think the export of their ideas and the actions of their government benefit the world, but people in most other countries disagree. Those in other countries dislike the spread of American influence and often say the U.S. creates more problems than it solves. These widely different views illustrate the gap between the American public and others, and may help explain why Americans are often surprised by global reactions to the U.S.
Americans generally support the actions of their government overseas and see these actions as multilateral. A large majority of Americans (75%) say the U.S. takes into account the interests of other countries when making international policy decisions. This is in sharp disagreement with people from most other countries. Similarly, while Americans almost unanimously support their government’s struggle against terrorism (89% favor), opinion is much more divided elsewhere. Nearly eight-in-ten Americans believe the United States helps solve global problems. Global publics disagree, though there is no consensus as to whether the United States does too much – as many French, Japanese, Indonesians and others believe – or does too little. Americans are also much more likely than other publics to say U.S. policies have not increased the gap between rich and poor countries. Nearly half (47%) say U.S. policies have either had no effect on this gap or lessened it. Still, it is notable that a plurality of Americans (39%) believes the United States has added to the global economic divide. Seven-in-ten Americans say that the United States should be promoting its ideas about democracy and business to the rest of the world. Clearly, there is less enthusiasm among the targets of these ideas. Likewise, six-in-ten Americans say the U.S. should be promoting its business practices around the world, though many people in other countries give a lukewarm reception to those practices. And in contrast with the rest of the world, Americans believe, in general, that the spread of American ideas and customs around the world is a good thing – 79% see this is a good thing and 16% say it is bad. For the most part, Americans feel much more favorably about exporting their culture than they do about welcoming other cultures. Half of the respondents in the U.S. sample say they like foreign music, movies and television, but a sizable minority of Americans say they dislike foreign cultural products. Generally, publics in other countries like American popular culture much more than Americans like foreign culture. The one area where Americans and people in other countries agree is in their admiration of U.S. technology. Americans are great admirers of U.S. technology, an appreciation shared by people around the world. Nearly all Americans (94%) say they are proud of U.S. technological and scientific advances, an opinion that is shared – in varying degrees – around the world.